I have been using custom fields to record some confidential data, but not want to transfer this data to labels. Does anybody know how it could be done please? Yes, I want to copy data from existing (private, catalog only) custom fields and create new private labels from them or map to existing private labels. Your screen shot looks like a useful feature when making labels, but I cannot find that feature for custom fields in the Info panel. Custom fields (which is custom XMP), via the Info panel, is written to the file if the setting is set to write XMP to the file. There isn't a setting to make them private. You can copy your existing custom fields to labels. It is a several step process. Not sure the script works in version 3, however. So, right click on a file (for testing), Metadata - Export Metadata to CSV File. Choose only one of your custom fields. It did not work here when I chose more than one custom field. Export. Menu ... Tools - Scripter. Select CSV file. Link your custom field to dc:subject. Start Import. The label will be created under the Miscellaneous label. 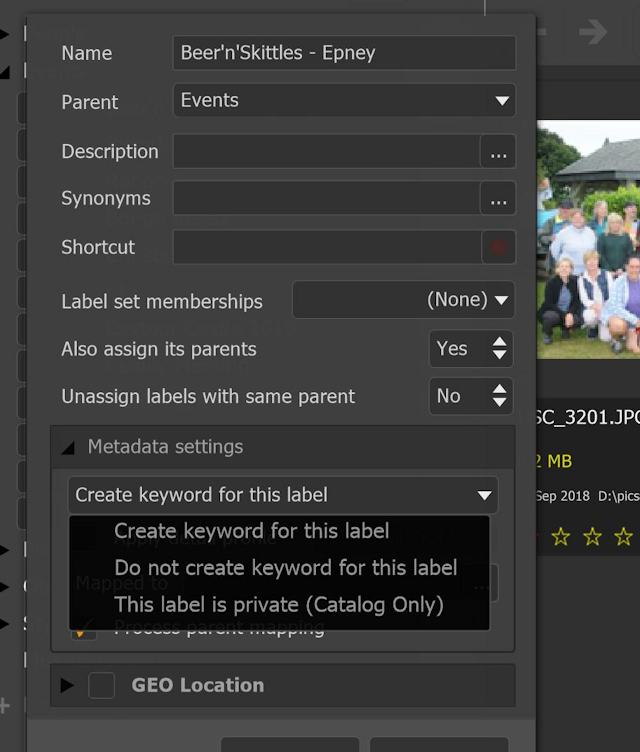 If it works ... and you process the remaining photos with that custom field, you can select all the labels at once, set them to be Private, and move them where they need to be moved. OK, I got it to work in version 3. I am assuming the lines are present for high resolution monitors. I don't have a high resolution monitor. But your signature states that you are using version 3! ??? I have version 3 and version 4 installed in parallel. I see your other post. I am on Windows. Is the process the same on a Mac? I don't know. I ran both side by side for a while, mirroring my workflow in both (yes, double the work) to ensure I understood what I had to do and everything worked. I started using version 4 exclusively only a couple of months ago. I don't have one monolith catalog. I have many. Thus, I use the command line parameters. OK, sanphotgn, thanks for the clarity. I was unaware about that of custom fields and initially created them believing them to be private. "if the setting is set to write XMP to the file"
Which setting are you referring to? Preferences - Synchronize Settings - Automatically write out Catalog changes to the image file. Is the user chosen name of the custom field written to the file or only the variable data entered? Is the ics:portfolios data also written to the files? Chosen name: yes. Data: yes. Portfolios data: yes (I think, I don't use this feature, just tried it and I see it in the file's metadata). Screenshot of ExifToolGui for a JPG file. TestingOne is the name of my custom XMP field. I used the default portfolio entries. I used this file to test the copying of the custom field to the label and you can see it worked in version 3. Note I did not enable the Private feature for the label, thus it was written to the file. Many thanks for all of the screenshots, which are helpful. Had I realised the interdependency of ICS and custom fields previously, then I would have never created them and used private labels instead. Before testing as per your suggestion, I'm wondering how I will be able find all files with a custom field populated? I have 10 custom fields. I could select a year and then filter by one custom field, however some years have >25,000 images, so I would have to split the year. Presumably I would have to repeat that process for all years in question and for all 10 custom fields individually? Before testing as per your suggestion, I'm wondering how I will be able find all files with a custom field populated? Go to Catalog - By Image Details. Expand Your Custom Fields. Expand each field to review the data. Presumably I would have to repeat that process for all years in question and for all 10 custom fields individually?